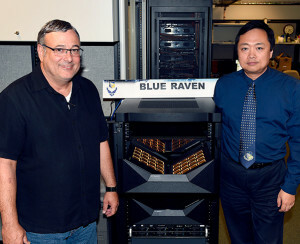 Mark Barnell (left), program manager of the Blue Raven project for AFRL, and Dr. Qing Wu, principal computer scientist for the project. 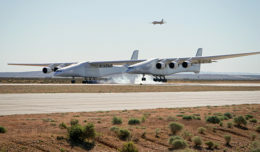 Together, they manage the business and engineering aspects of the effort. The Air Force Research Laboratory, in partnership with IBM, unveiled the world’s largest neuromorphic digital synaptic super computer, dubbed ‘Blue Raven,’ at AFRL’s Information Directorate Advanced Computing Applications Lab in Rome, N.Y., July 19. Today, challenges exist in the mobile and autonomous realms due to the limiting factors of size, weight, and power, of computing devices – commonly referred to as SWaP. The experimental Blue Raven, with its end-to-end IBM TrueNorth ecosystem, will aim to improve on the state-of-the-art by delivering the equivalent of 64 million neurons and 16 billion synapses of processing power while only consuming 40 watts – equivalent to a household light bulb. Beyond the orders of magnitude improvement in efficiency, researchers believe that the brain inspired neural network approach to computing will be far more efficient for pattern recognition and integrated sensory processing than systems powered by conventional chips. 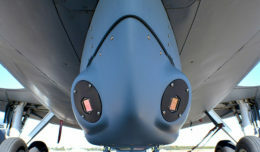 AFRL is currently investigating applications for the technology.